It was in March of ’59, and I was in 8th grade, when NE Iowa had two major snowstorms about a week apart. We had something like 20″ of blowing snow in northern Delaware County from the first storm, and we were unable to go to school for a week, and the tank truck could not get to our dairy farm to pick up the milk until the county plows were able to break through. We and four other families lived in an unusual circumstance where all three roads that lead away from our farms ended at T-intersections at the bases of short steep hills. The snowdrifts across the roads would accumulate to prodigious depths on these hills, and without the ability to get up a good head of steam, county snowplows had much difficulty moving the snow from the road on those hills. When they finally did break through, the V-plows they used left very tall banks of snow thrown on either side of the narrow passages they made in the snow. 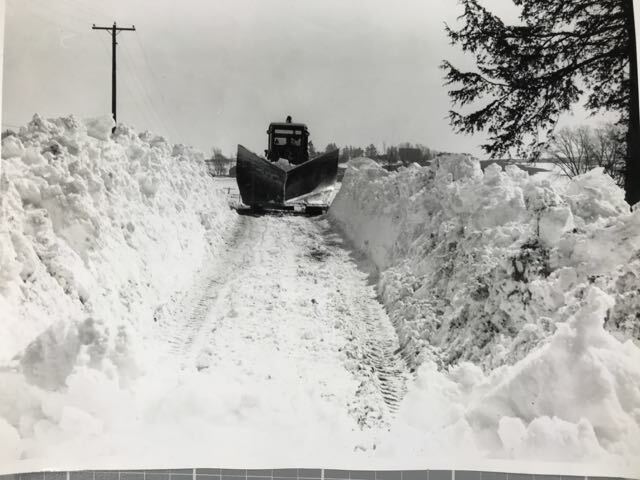 (The photo above was taken near the Johnson farm in April 1973) The county did not have the option of massive snow-blowers that we have had available in recent years, so deep snow required the plow to plunge into the drift at speed, back up and punch at it again and again and again. This took quite some time, and the county was apt to clear most other roads in the area before tackling our unique situation. The refrigerated milk storage tank in the barn filled daily, so the truck had to come every day to pick up milk and take it to Sanitary Dairy in Cedar Rapids, but because of the storm, that was not possible. Cows must be milked on a regular schedule (every 12 hours usually) in order to keep them healthy and productive, so not milking them is never an option. We faced the loss of significant income from our Grade-A whole milk if we could not get the milk to market for several days. Whole milk is roughly 4% cream, and cream is a valuable component of milk, used particularly for the manufacture of butter. Some dairy farmers in the ‘50s, and many farmers in earlier years, would sell only the cream, using a mechanical separator to extract it from the whole milk, and send it to market in 10-gallon cream cans. The skim was fed to farm animals. So my dad hatched a plan–put the milk in the tank, and remove the agitator—there is a “stirrer” in milk tanks to prevent the cream and milk from separating and to promote even, rapid cooling of fresh milk. Cooling was not an issue in winter, and we wanted the cream to separate! With the agitator removed, the cream would rise to the top over several hours, leaving skim milk at the bottom of the tank. Just before milking time, we would open the valve at the bottom of the tank and allow the skim milk to run out, leaving the cream in the tank. Some of the skim milk would be fed to our pigs, but since there was so much of it, most was simply allowed to drain out into a field. Doing this twice a day over the better part of a week left us with a tank full of the valuable cream, but we to get it to market, and that was not simple—tank trucks and our dairy only handled whole milk. Fortunately, we had a few old milk cans left after converting to the tank system a couple of years earlier, and were able to borrow a few from neighbors. We contacted the creamery in nearby Greeley, IA, well-known for its butter-making, and arranged to ship the cream to them. Once transferred to cans, we hauled the cream to Greeley, and had a decent payday so we came out only a little short. With the opportunity afforded by all the cream available that week, we kids churned some butter of our own, and made some very rich homemade ice cream! Then, just as the roads were finally opened, and we had a chance to market the cream and provision our household, another 12” of snow and a blast of wind hit. The recently plowed roads drifted shut again, though now much deeper than before because of the tall banks left along the sides of the roads by the snowplows. We knew the county would really be challenged to move this snow in a timely fashion. In order to move things along and avoid further difficulties with milk pickup (and school buses), my dad and several neighbors hired a contractor to use a bulldozer to clear the roads to our farms—and even the bulldozer found the task to be a challenge.